I should have known. Almost every Lent there is a new discovery of a relic that is going to blow the minds of Christians everywhere when they discover the REAL Jesus. This is getting old and boring. Michael Barber has the scope over at his place, the Sacred Page: The “Discovery” is a Fake: Another Triumph for Biblioblogging. “Long story short, after further investigation it is now clear that these “newly” found “documents” are fakes–and the world has the biblioblogosphere for revealing that. While media reports have sensationalized the story, academic bloggers have been slowly picking this apart. Mark Goodacre has an excellent round up. See also James McGrath’s post. 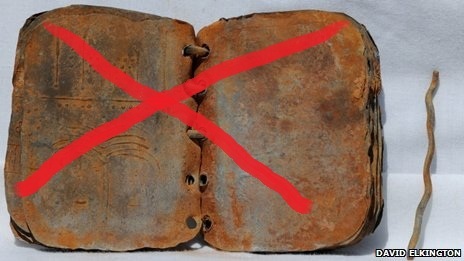 I wondered if it was a fake when I read some about the current owner, who is not the person who ‘discovered’ the book. He has told some reporters that he inherited it from his grandfather. He told an auction house he bought it from a dealer. Wouldn’t the amazing story of this discovery be consistent from day to day if it were authentic? And for a supposed Bedouin the owner is surprisingly western in his clothing and shaving! “…The books are currently in the possession of Hassan Saida, in Umm al-Ghanim, Shibli, which is at the foot of Mount Tabor, 18 miles west of the Sea of Galilee. …When he first obtained the booklets, he had no idea what they were or even if they were genuine. Hardly the work of an “illiterate Bedouin” as claimed by some articles.